Who is the opposition to Los Altos Measure A? A crosstown group of concerned Los Altos residents, families and neighborhoods that feel the proposed project is too big, too expensive and not well thought out. This one proposed community center project impacts every homeowner with property tax increases for 30 years, and additionally depletes City reserves that could be directed to fund needed city services, emergencies or other unfunded citywide projects. The No on Measure A group is mobilizing neighborhood voices, community organizations and neighbors to educate residents and voters about the Nov 3, 2015 election for Measure A and the proposed Hillview Community Center project. This massive proposed city project-with city-verified estimated construction costs of $160 MILLION - will impact ALL residents, and is based on a conceptual plan that outlines excessive expansion in size and scope of facilities, missing financials and operating costs, a misdirected vision of how the supersized facilities will be funded and rented, undetermined future cost and plan details, and unwarranted decisions directed by hired consultants and special interest group recommendations to fast-track this project forward to a Nov 3 election. ﻿Website:﻿ The No on Measure A campaign is using one of our neighborhood group websites, http://www.LosAltosNeighbors.com to reach voters and local residents. And encourage all neighbors and residents to get informed, come together, share facts, and speak out ----and VOTE NO ON MEASURE A. Residents can get involved on the website---READ articles, SIGN the NO petition, SHARE the facts, SEE what your neighbors are saying, and SUBSCRIBE to the weekly email updates. We welcome volunteers to talk to neighbors, write an article, & donate to the outreach efforts. Donations: The No on Measure A campaign is set up to accept donations through the Silicon Valley Taxpayers Assoc., tax ID 1347578. We are accepting funding only from Los Altos residents, and all funding will be kept for Los Altos. Donations can be written to Silicon Valley Taxpayers Association, No on Measure A. Contact us at no-on-measure-a@losaltosneighbors.com and we can provide you with instructions and receipt info. Along with defeating Measure A and this massive, financially-crippling Hillview Community Center project, we see a critical need for planning reform in Los Altos. Projects of this magnitude with so little detail, analysis, and understanding of costs and financials or the community it serves, should NOT be proposed for residents and voters to even consider, much less pay for. And the current process tied to ad hoc planning, bond consultants, stakeholders and special interest groups needs change. 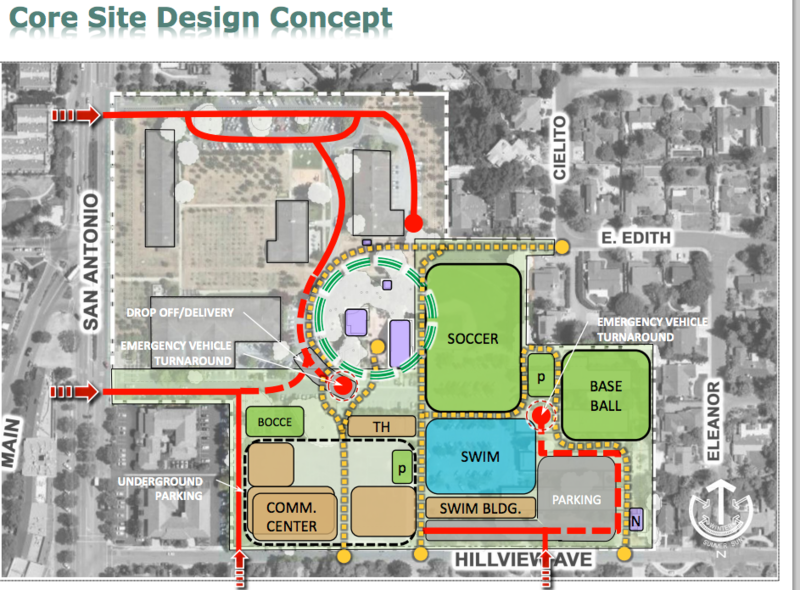 We all want a revitalized, right-sized replacement for the Hillview Community Center on the Civic property ---and welcome new ideas for places and spaces, both outdoor and indoor, where the Community come together. This proposal however is far beyond the size, needs, costs and priorities for Los Altos residents, neighbors and our community---and burdens every resident with increased taxes and unknown future costs. - "The city is asking for a massive amount of money, yet there is no plan for it! " Adding in 3 pools (teams, training, wading) with bleachers and a separate building is "hugely wasteful and unnecessary"
- Our city councilmembers are the stewards of our money, and I find this bond proposal to be a thoughtless, poorly planned and insensitive use of our money. - For many residents, this proposed project is jaw-dropping in dollars, with not enough sense. The understanding of the true cost of these facilities---total cost of debt repayment, operating costs, impact of city reserve depletion is missing from this plan. READ MORE NEIGHBOR VIEWPOINTS- by topic. AND DON'T FORGET TO SHARE AND SPREAD THE FACTS.